Being able to rotate between two different herbicides prolongs the usefulness of both. Even if weeds develop some resistance to glyphosate (the active ingredient Roundup Ready crops are resistant to) the weeds are killed next year when the farmer sprays Glufosinate (the active ingredient that Liberty Link crops are resistant to). 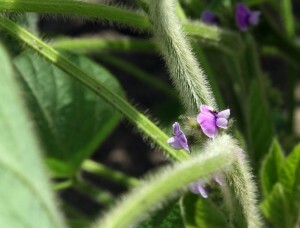 Did you know soybean flowers are often purple? I never noticed until quite recently. Soybeans are the number two source of vegetable oil in the world (after oil palms) and the top one in the US. They are also a very important source of protein in animal feed and most vegetarian diets, especially in the form of tofu**. Rotating soybeans with corn was originally introduced into midwestern agriculture as a way to address depletion of nitrogen in the soil after many years of farming. Soybeans can turn the inert nitrogen in our air into forms that are biologically useful***. After harvesting, the soybeans plants themselves can be plowed back into the field’s soil. Their decay releases the nitrogen they turned into biologically useful forms into the soil, where it can be absorbed by the roots of corn or other crops grown in the same field next year. (A similar system became popular in the Southeast. 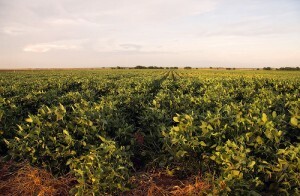 Growing peanuts between crops of cotton became popular because peanuts have the same ability to change the nitrogen from our air into biologically useful forms). Most of soybean derived food I eat is probably in the form of meat and processed foods (for example I just checked my bottle of peanut butter and it is made with soybean, canola, and/or cottonseed oil). As tasty and delicious as soy sauce is, it probably doesn’t qualify as a dietary staple. As someone who studies comparative genomics, it’s interesting to note that soybeans have gone through two relatively recent sets of genome doubling. You can read more about the soybean genome project here. *Tilling is when a farmer drives a plow (well a cultivator, which is lots of plows pulled together behind a tractor) between the rows of his or her crops, physically cutting up or burying weeds (either in addition to, or occasionally instead of chemically ie using herbicides). The problem with tilling is it breaks up the soil so a lot more is washed away by the rain. With effective enough herbicides farmers can entirely stop using mechanical means to control weeds, which drastically decreases erosion. Keeping more topsoil on farmland and out of rivers is a Good Thing™. ***This is actually a deceptive way of putting it. No plant (that I know of) actually fixes nitrogen itself. What certain groups of plants have learned to do is enter into partnerships with bacteria that do know how to fix nitrogen. The bacteria produce the biologically useful nitrogen the plant needs to grow and live. In return the plant protects the bacteria within bulbous growths of its roots, feeds them with the energy it gathers from the sun, and maintains the ideal levels of oxygen. Too much oxygen and the bacteria can’t fix nitrogen, too ittle and the bacteria suffocate. The soybeans and other nitrogen fixing plants control the levels of oxygen available to nitrogen fixing bacteria using a protein called leghemoglobin, which is both structurally and chemically similar to the hemoglobin our own red blood cells use to transport oxygen around our bodies! It’s even red like our own blood! <– Isn’t that last one both awesome and amazing? Posted in: agriculture, Crop Profiles, Plants. I marvel at the plant world. Holy cow.